In the real estate industry, the Minnesota Rural Development loan is commonly called a rural loan. This comes from the single most important requirement for the mortgage; the prospective property must be in a rural area as designated by the Department of Agriculture. Thanks to the internet, it is possible to look up these designated rural areas rather quickly. The USDA property eligibility site allows consumers to look up a rural area by state, or, by property address. Generally speaking, there are multiple areas across Minnesota that fall in the designated rural locations. The USDA guidelines will allow borrowers to receive a loan up to 100% of the home’s appraised value. Compared to other loans that ask for a down payment ranging from 3% to 20% of the home’s asking price, this one factor alone can save borrowers a ton of money. It may also mean that borrowers can buy a home now since there is no need to take time to save up for the large down payment. The USDA loan is not intended for the purchase of large farms or properties with a significant amount of acreage. Instead, USDA will finance a single-family home. The home purchase may include up to 5 acres of adjoining land. Townhomes as well as condos may be eligible, if they are in a rural area and approved or accepted by HUD/FHA, VA, Fannie Mae or Freddie Mac. A person applying for a USDA home loan must intend to live in the home as their main residence. The USDA program will not approve financing if the property is an investment home, a second home, or rental property. The Minnesota rural development loan is designed for people with moderate to low income. For this reason, there are strict rules about the borrower’s income that must be applied. The rule states that the borrower’s household income may not exceed 115% of the median income for their area. For example, if the median income is $60,000 for your area, you would be allowed to make up to $69,000 per year and still apply for the loan. There are 2 things to keep in mind about the income limits. First, the income limit is based on the number of people living in the home. Therefore, a family of 5 will have a larger income limit compared to a married couple with no children. Secondly, the income from all working people in the home is counted. For example, if the mom and dad both have full-time jobs, and their 17-year-old daughter has a part-time job, the daughter’s income will also be included in the calculations. The USDA rules do not have a specified maximum loan amount. Instead, the lender calculates the maximum amount the borrower can receive based on the size of their household, their total yearly income and their debt. As long as the borrower meets the income guidelines for their area and meets the debt to income guidelines, they can be approved for the loan. The Minnesota rural development loan has 2 calculations involving the borrower’s debt and income. The first calculation is called the primary ratio and the second calculation is called the overall ratio. Keep in mind that higher credit scoring borrowers may be able to exceed these ratios. For the primary ratio, no more than 29% of the borrower’s monthly gross income can be used for the proposed mortgage payment, including property taxes and the property insurance. For the overall ratio, no more than 41% of the borrower’s monthly gross income may be used for both the mortgage payment and all other debt. As an example, using the previous example of a yearly income in the amount of $69,000, this means the borrower has a monthly gross income of $5,750 ($69,000 divided by 12 months). For this example, the home payment plus taxes & insurance cannot be higher than $1,667.50 and the mortgage payment plus all existing debt cannot be higher than $2,357.50. If you need help with these calculations, your mortgage lender can review your income and credit report and show you the two ratio calculations. Along with the income requirements mentioned above and the property location, there are a few other things to keep in mind when considering the USDA mortgage. Regardless of your citizen status, you will be asked to provide documented proof verifying the status. Although the Minnesota USDA loan is popular among first time home buyers, it is not a requirement. People that are buying their 3rd or 10th home are welcome to apply for the loan. The credit requirements for USDA loans are not as strict as conventional loans. The lending guidelines are very similar to the FHA rules. Thus, people that have less than perfect credit have been able to qualify for the program. The interest rate charged for a USDA home loan is very comparable to mortgage rates for other loans such as the FHA, VA and Fannie Mae loans. This makes the principal & interest payment similar as well. In order to bear the risk that a borrower may not repay the full amount of the mortgage, the USDA program charges private mortgage insurance to all borrowers. This insurance fee is designed to protect the lender. Currently the private mortgage insurance fee for Minnesota USDA loans is charged in two different ways. First, there is a 1% of the loan balance fee that is charged at the beginning of the loan. USDA will add this fee to the total loan amount so that the borrower does not have to pay if out of pocket. Secondly, 0.35% of the mortgage balance is charged yearly. This fee is divided by 12 and added to the normal home payment. Who Should NOT Get a Minnesota USDA Loan? 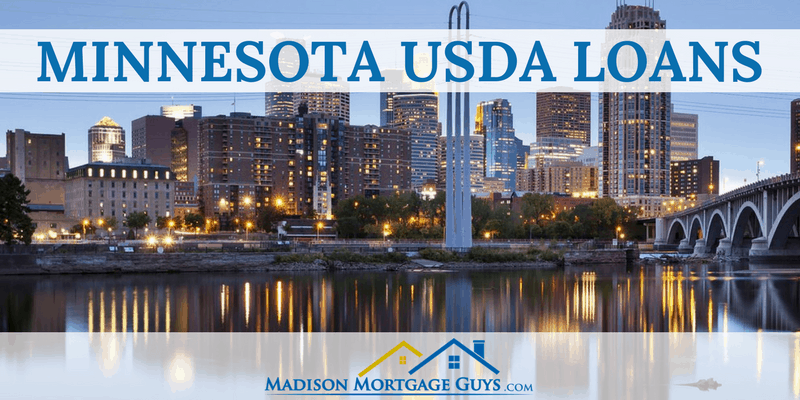 There are really only 2 reasons why a person should not consider using the Minnesota USDA loan for their next property purchase. The first reason is a desire to live deep in the heart of the city. While it is true that nearly every county in Minnesota has some areas designated as rural, the downtown location of most cities does not qualify for a USDA mortgage. People that dream of living in a condo that overlooks the city, or a home that is at the apex of town, should not consider using the USDA program for their home purchase. The second reason is a high income. There are many people across this great country who have found a way to excel at their career and earn an annual income that is much higher than the average person. This type of income is too much for the USDA program. With that being said, the Minnesota rural development loan is a great fit for a lot of people. Potential home buyers that have average income and don’t mind living in the suburbs or outskirts of town will see that the benefits of a Minnesota USDA Rural Development loan can help them get an affordable home with absolutely no down payment.